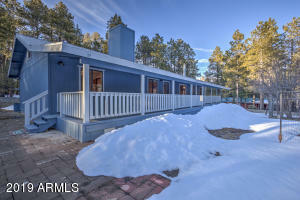 If you’ve been dreaming of a cabin in the tall pines but want something newer your search is over! 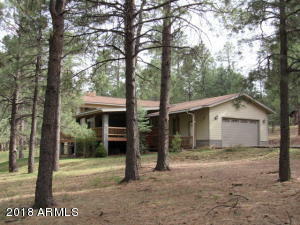 Welcome to 3377 Summer Loop in Forest Lakes, AZ. Imagine your own place, to get away from the sweltering heat in Phoenix, only a scenic 2 hours drive to get there. 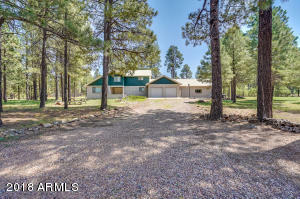 Then imagine sitting on your covered deck, sipping a glass of wine and unwinding to the aroma of the towering Ponderosa Pines. Take a hike to the nearby Forest Lakes pond and toss a fly to rising trout as a bald eagle keeps watch. This can be more than a dream! In Forest Lakes it’s a common occurrence. 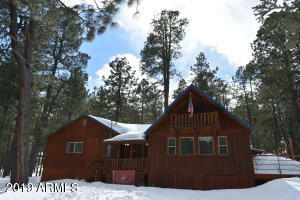 3377 Summer Loop is a most special of 3 bedroom cabins for sale! A light and bright chalet with a beautiful window wall seems to bring the scenic pine forest right inside. Plenty of room with a nice master suite with a large walk in closet and a barn door entry to the well appointed bathroom. Upstairs are two guest bedrooms and a bathroom with barn wood look tile shower and antique vanity with a wash bowl vessel sink. The loft has a walk out deck and sitting area. The country kitchen overlooks the spacious great room and dining area. Super efficient design built to International Energy Conservation Code (IECC) standards. High efficiency electric heat, U.25 windows and sliders (better than low E) and cork flooring, 2″x 6″ wood frame construction and R38 ceiling and R20+ wall insulation. Dramatic vaulted ceilings with tons of wood T&G walls and ceiling and log stairs. Stone hearth and mantle wood or propane fireplace. 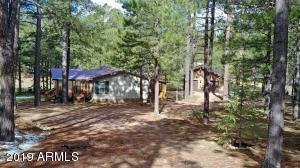 Don’t miss your chance to own this special brand new cabin in the Mogollon Rim Country in the gem of the high Country, Forest Lakes, Arizona!